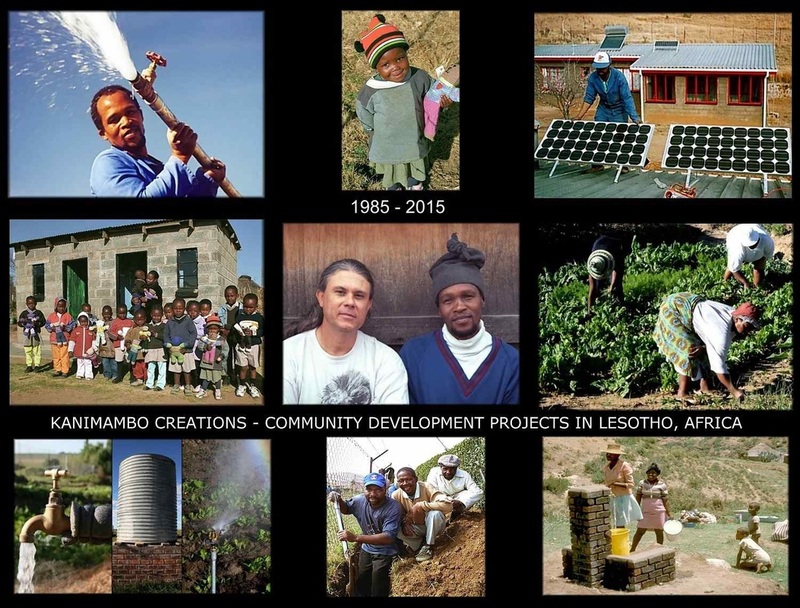 The non-profit organization Plenty came to the Kingdom of Lesotho, southern Africa, in the late 70’s, as the first African volunteers who had received technical training in the USA and Canada, returned home to initiate the Plenty Lesotho Rural Development project. With financial backing from both Plenty Canada and Bread for the World (Germany) the construction of the Village Technology and Training Centre (VTTC) began at the Quthing River Valley, with the aim of being both a base for our volunteers and a technical hands-on school for training local people in various skills relevant to their needs. Plenty USA also contributed to the project by assigning some of their skilled volunteers to Lesotho in order to assist with its construction. Respecting the traditional values, practices and wishes of our hosts, we planned together every phase of implementation. The Centre was built from local available materials such as sandstone, thatch grass, bricks and concrete blocks manufactured by local entrepreneurs. The architectural design was inspired from the local villages layouts so that it would fit within the surroundings. We used appropriate technology and energy as much as possible, including solar electricity and solar water heating for most of our basic needs at the Centre, to serve as an example to other communities and projects in Lesotho. As per local people's request one of the main priorities became the Village Water Supply program, through which more than 30 villages in the valley were assisted with gravity-fed water supplies throughout the first few years of our program. We also succeed in training quite a few local technicians in the various developed skills regarding spring catchment, water storage and distribution. Plenty Canada with funding from C.I.D.A (Canadian International Development Agency) provided the basic materials, skilled labour and technical supervision, while the villagers contributed with basic labour such as trenche excavation and back filling, manual transportation of sand and aggregate to the building sites. Canadian volunteers soon joined the project to establish a tree nursery and work closely with local chiefs and villagers to grow trees all over the barren hills of the Quthing River valley. These trees grew quickly, providing protection of the villages water springs, arrest the severe soil erosion, fuel wood and building materials in this region of the country. In the fields of agriculture and nutrition, our volunteers carried out research with local farmers and families in order to establish their needs. Increasing food production became another priority and with funding from Canada we purchased a tractor with a few basic implements for our agricultural program with local farmers. Sorghum, soybean and maize trials were carried out to see which varieties were more suitable for that climate and soil conditions. We also assisted several Basotho women to establish community gardens with irrigation systems, consequently improving their food self-reliance and diets of their families. Volunteers taught local women how to cook with soy and soon we got funding to build a fully equipped soy dairy at the Centre. In 1985 two of the main Plenty Lesotho's team, Mwana Bermudes and Nako Mpana left the rural development project in Quthing moving to the capital Maseru with their families where they established their own consultancy and technical services firm running it successfully for over 14 years. Their technical services included basic building maintenance and in the field of rural community development they provided both consultancy and technical supervision of projects in the fields of water supply, irrigation and sanitation. They made a good name in town and soon they won long term contracts with the largest international embassies and development organizations operating in Lesotho. Among the non-governmental organizations Plenty Canada became one of their main clients and they have been contracted all these years to implement several community development projects in the suburban areas of the capital city, including water supply & irrigation, vegetable production and sanitation projects. 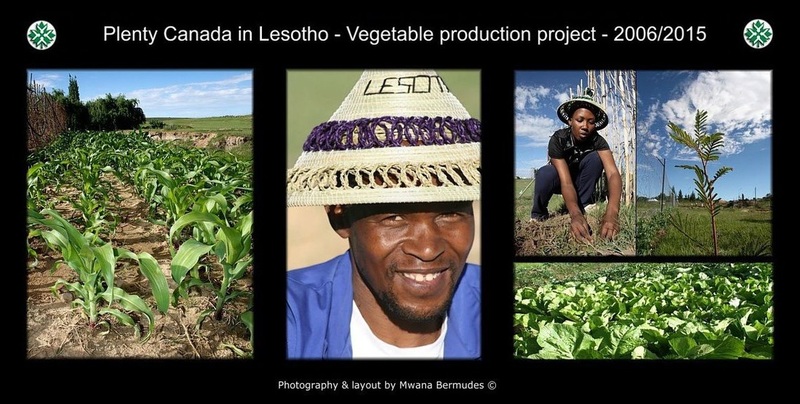 One of those projects in Lesotho financed by Plenty Canada which is still running successfully today is a land reclamation & vegetable production at the outskirts of the capital. With the approval of Botchabela's chief, Nako secured a couple of acres of severely eroded land in order to establish a pilot project concerning land reclamation and viable vegetable production. Nako and Mwana hope to inspire other villagers to do the same and also provide practical techniques to help families to take more control of their food supply and nutritional needs. The vision of so much produce in that small piece of land is indeed impressive and made them so happy to experience their precious vision together once again, much easier to envisage a self-sufficient and hunger-free Africa, an old dream that can eventually come true!